TransylvanianDutch: Where do I click? In the comments to my Disaster post, Thomas MacEntee of Thomas 2.0 suggested I research old newspaper articles to see if there were cholera or typhoid outbreaks in Texas and Pennsylvania in 1840. I haven't found the answer to that question yet, but that did inspire me to search some of the old newspaper resources online for my Sliver ancestors. I haven't focused much on this branch before. Even though I don't know the parents of, or much of anything about, my fourth great grandfather, John Sliver, I've focused my research elsewhere. There's been a lot of research done on the family tree of his wife (Barbara Fretz), so it wasn't as if the tree completely stops there, and I think I partially had the concern that I'd experience the same problems I had with my Denyer relatives in searching newspaper articles. Optical Character Recognition by its nature has to be a little fuzzy, and as Denyer and Denver are easily confused, so would Sliver and Silver. But I knew his daugther, Elizabeth Sliver, was born in Bucks County, Pennsylvania, and that she married William Denyer in Baltimore, Maryland, before they headed South to Texas. So I knew where to expect the articles to be. And the search turned out better than I expected. 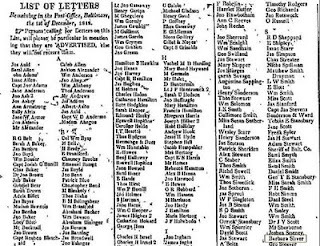 At GenealogyBank, I found in several issues of the Baltimore Patriot, "lists of letters" left in the Post Office, like the one above. The Slivers (Parents John and Barbara, along with daughter Elizabeth) appeared a few times from 1818-1820. I wanted to know where to click to view the letter, but apparently that feature isn't operational yet. While it's just a name in a list, it does place them in Baltimore. Elizabeth married William Denyer in Baltimore in 1821. None of the brief biographies I'd read in family histories mentioned that the Sliver family had definitively moved there from Pennsylvania. I knew William Denyer also spent time in Bucks County, so Elizabeth and William might have gone to Baltimore on their own. I know Elizabeth's mother, Barbara, joined Elizabeth and William on their journey south, as she died in Texas, though I don't know when and where John died. It could have been at either endpoint, or on the journey inbetween. I also turned up an 1851 obituary for an Abraham Sliver in Baltimore. I'm not sure if he's related or not, but in the 1810 census there is an Abram, John and a Henry Sliver in the same village in Bucks County, all with small children. Siblings? Cousins? Happenstance? It's not clear. But I do have a sliver of more data. Depending on the OCR that you are using try substituting l for i. When searching for Hollington I use Holllngton and hoiiinglon, etc. When searching in 20th century papers I've had success searching by address rather than name.